Planting Dates: Pumpkins can be planted any time after the last frost, but to time your planting for Thanksgiving and Halloween you have to do a little planning. If the variety needs 100 days to mature, pick the harvest date and count back 100 days or a few more for a cushion. In general, April 1 - July 31. Planting Method: Plant the seeds after all danger of frost is gone and the soil temperature is at least 70°. Use 4-6 seeds every 6 feet in rows about 8 feet apart, about 1-1/2 inches in the soil and a little deeper in sandy soil. Seed Emergence: 5-14 days when the soil is between 70-95°. Within 10 days of emergence, thin the seedlings down to 2 per hill. Pinch them off instead of pulling them up to avoid hurting the two winners. Height: High climbing and/or spreading. Can grow 12-15 feet and cover 200 square feet of the garden. Growth Habits: Large stems and foliage, large yellow flowers. Pumpkins and squash are similar. The main difference is the stem. Pumpkin stems are tough and angular, while squash stems are round and more tender. Pumpkins have large root systems. Culture: Pumpkins grow best in loose, coarse-textured soils; however, they will grow and be productive in almost any well-prepared soil. Mix in lots of compost, lava sand, Texas greensand (in alkaline soils), and soft rock phosphate. Mulch the bare soil around the young plants as they start to grow. Fertilize three times with organic fertilizer and spray Garrett Juice at least monthly. Pumpkins have normal water requirements. Troubles & Solutions: Poor pollination can be solved by encouraging biodiversity, especially bees and other beneficial insects. Some gardeners like to dab the male flowers on the female flowers (those with the swelling behind the flower). That’s okay, but way too much trouble for me. The organiphobes say to only spray in the late afternoon when honeybees are not active. That’s nuts! Don’t use poisons at all - ever! Treat for mosaic virus, powdery mildew, downy mildew, and other diseases by building soil health and spraying with Garrett Juice plus garlic and potassium bicarbonate. Treat aphids with sugar water and by releasing ladybugs. 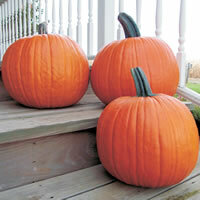 Harvest and Storage: Pick pumpkins when they are the size and color you need and always leave a 2-4 inches stem stub. Well, at least an inch. Leaving no stem stub invites disease. 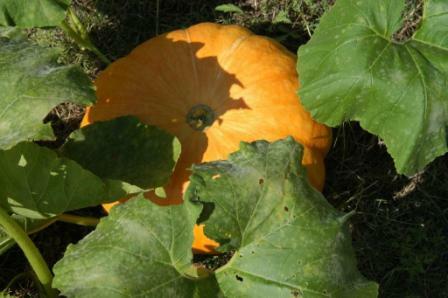 Pumpkins can still be harvested after frost. For long-term storage, cure them in the sun for a week and then move to a cool, dry place. For winter storage, the skin should be hard. They will store up to 6 months at 45-50°. Notes: Don’t plant other vegetables close to pumpkins. They will get run over. Varieties: Autumn Gold, Jack O’ Lantern, Jackpot, Big Max, Funny Face, Spirit, Small Sugar and Jack-O-Lite.